Rather than reinventing the wheel, I have tried to compile the best of what the web and other sources have to offer. 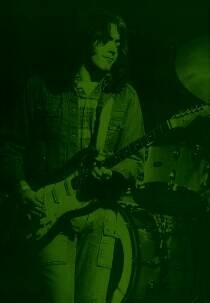 Rory Gallagher is a hero and icon of rock music. He inspired guitar players from The Edge to Johnny Marr, Slash to Gary Moore, Johnny Fean to Philip Donnelly, Declan Sinnott to Brian May. He toured incessantly and sold over 30 million albums worldwide. In 1963, at the age of fifteen, Rory bought his trademark Fender Stratocaster. He discovered the blues when pop magazines and radio were scarce in Ireland and later won the Melody Maker Guitarist of the Year in 1972, ahead of Eric Clapton, Jimmy Page and Jeff Beck. Acknowledged as one of the world's leading guitarists, he collaborated with his boyhood hero Muddy Waters, played with Jerry Lee Lewis, Albert King and Lonnie Donegan. In this compelling biography, contemporaries, fellow musicians, film maker Tony Palmer and Taste drummer John Wilson tell stories about Rory from his meteoric rise in the late-1960s with Taste to his remarkable solo career. This is a compelling testament to the musical life of a shy and retiring working-class hero, distinguished by his check shirts and his astounding dexterity on acoustic and electric guitar - the guitarist and blues man who blazed a trail for others to follow. We are trying to get the BBC to honour Rory Gallagher by playing his shows on BBC4. I have made a petition and it also has a Facebook page and I would be honoured if you were to put it on your website and let everyone you know about it, it would mean the world. It has received the backing of Band of Friends which has the sublime Ted McKenna and Gerry McAvoy and Marcel Scherpenzeel. So, big endorsement and we are so grateful. I have contacted the BBC and slowly but surely I think it will be done. Cloned from Rory Gallagher's original 70's Hawk® booster. click on photo for all of the details! 'Thanks a million' to all of the people who have contributed to this page in many ways!! Materials on this site are for private study, scholarship, or research purposes only. Please read the copyright notice before copying material from this website. The copyright law of the United States Of America (Title 17, United States Code) governs the making of photocopies or other reproductions of copyrighted material. Under certain conditions specified in the law, libraries and archives are authorized to furnish a photocopy or other reproduction. One of these specified conditions is that the photocopy or reproduction is not to be "used for any purpose other than private study, scholarship, or research." If a user/visitor of this website uses a (photo)copy or reproduction of any material for purposes in excess of "fair use," that user/visitor may be liable for copyright infringement. Many items on this website do not contain individual copyright notices. The lack of a notice does not necessarily mean that the work is not protected by copyright law.